Five years ago Inbusiness reported a British textile manufacturing revival, ‘led’ by Lancashire. 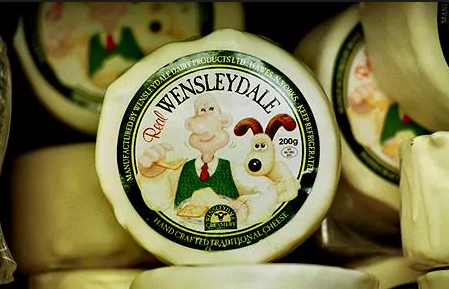 It reported that, after decades of decline due to rising foreign competition, tariffs and protectionism, and Britain’s high cost base, some manufacturers are successfully competing with overseas suppliers. This 2012 text prompted a search to see what is happening today. Leigh Spinners, once a cotton mill, operated by the family firm that built it, now focuses on making carpets and synthetic turf. John Morrison, managing director explains:”About three years ago we decided to convert to tuft grass, artificial grass,” he explains. “We make 150,000 square metres a year. 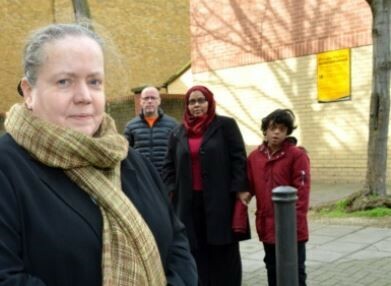 There is big demand, for school playing fields, and so on”. Its huge listed building is now underutilised and Leigh Building Preservation Trust is working with the Prince’s Trust and Leigh Spinners to restore the building for additional uses. Lance Mitchell, of Mitchell Interflex in east Lancashire, makes cloth, furnishings, interlining and traditional narrow striped fabrics for deck chairs and might have further diversification in mind as he finds the ‘industrial side of fabrics’ fascinating: “Modern fibres are being developed all the time – McLaren cars are based on a woven product, and the next generation of aircraft, they say, will be woven”. This brings to mind the work done on hemp-based panels for the car industry (‘biocomposites’) piloted earlier at the University of Bangor. 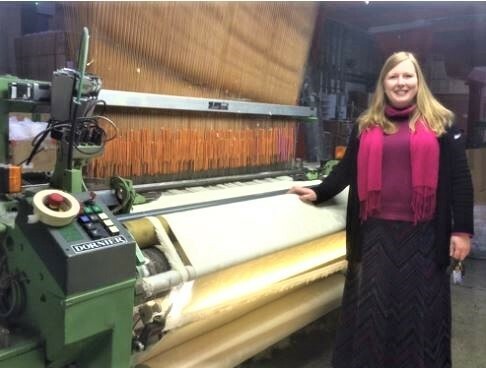 S Dawes Weaving in Nelson makes ‘high end’ jacquard fabrics for the furnishing, upholstery, industrial and apparel markets (including organic cotton), as well as high-performance fabrics for the automotive and defence sectors. In 2015 Dawes upgraded its design capability with the purchase of the Ned Graphics software system along with new Jacquard looms. This was followed by further capital investment last year when they took delivery of a Karl Mayer GOM Sample Warping Machine. June 2017 saw another major investment: a new single end Jacquard machine – one of only 3 in Europe. Their prices are similar to those of comparable material made in the Far East because of the difference in transportation costs and taxes. Dawes’ designer Joanna Brocklebank (above) oversees the designs for such clients as John Lewis and Laura Ashley. Community Clothing is a manufacturers’ cooperative (workforce above). On top of intense competition from cheap labour markets one of the biggest challenges the UK factories face is the seasonality of demand. For several months of every year even the best factories are operating at well below full capacity. Community Clothing was founded in 2016 to address this exact issue. By utilising the spare capacity to make a range of stylish, great quality, British-made clothing, Community Clothing are able to create job opportunities and stability, filling British factories all year round. David Collinge manages John Spencer Textiles, a family-owned company in Burnley, which had formerly specialised in shirt materials but had to find a new market. They began to make fabrics for the Ministry of Defence, for combat clothing, artillery uses and parachutes. They also developed their own brand in furnishings and home textiles. They are to invest £400,000 in new technology and equipment with the support of a £55,000 grant from the N Brown Textiles Growth Programme. Bolton Textiles Group supplies contract furnishing fabrics and production and design services to retail, hotel, cruise ship, restaurant and bar operators The Bolton Textiles Group comprises four companies, Rufflette, Cliq Designs, Sinclaire and JH Cunliffe & Co, covering textiles, manufacturing, weaving, yarn processing and ‘cut, measure and trim’ services. The companies share two factory sites in historic converted mills in Bolton and Rochdale, producing curtains and curtain tapes, quilted and bedding products and fabric designs. 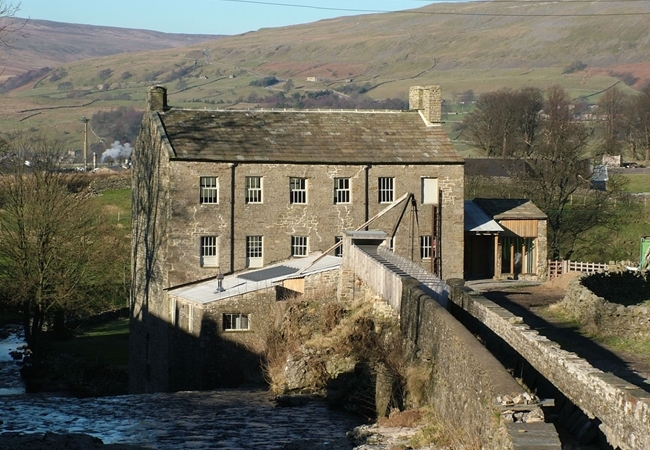 Lancashire Textiles persevered throughout the difficult times and continues to be a strong and successful business. Its workforce produces superior quality products manufactured in-house to British Standards 5335 1994, 5852 parts 1 and 2 and 7175. It has a vast range of online products and an experienced sales team. Its products range from quilts, pillows, cushions, mattress toppers, mattress protectors, duvet covers and other bed linen, to bath towels and made to measure items. The latest news from the county is that the Lancashire Textiles Manufacturing Association ran its 7th Student Study Tour on 17th May this year. The study tours give textile undergraduates from Manchester Metropolitan University an opportunity to see commercial textile production. 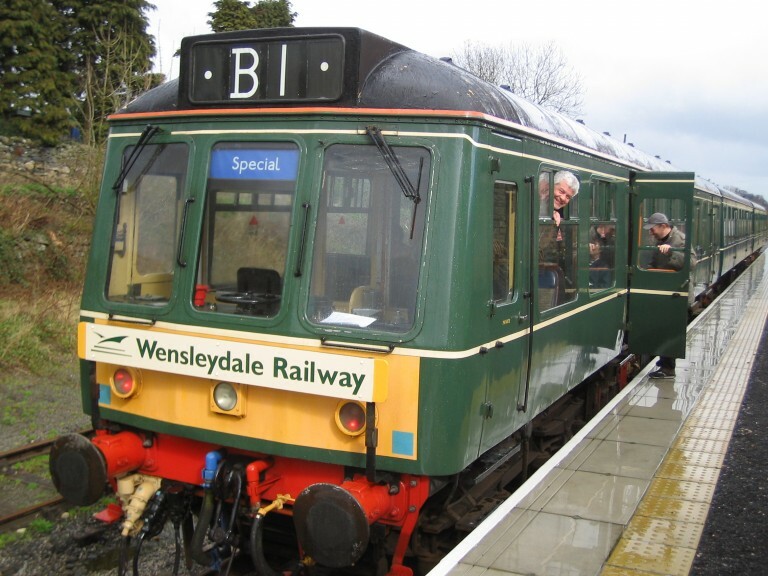 They visited D H J Weisters in Darwen, which weaves quality fabrics, Blackburn Yarn Dyers (cotton and blended yarns) and John Spencer Textiles in Burnley where they saw a range of fabrics being produced, including curtaining, protective clothing, fashion and industrial fabrics. It is often recorded that investment in better machinery brings rewards and a fairly new development in the SME sector is the acquisition of software for a whole range of purposes from marketing management to stock control; Dawes installation of NED Graphics is one example. Another company recently recommended OrderWise which automatically accounts for stock levels, forecasts demand, forwards orders, records minimum stock requirements and even emails, faxes or prints orders then sent directly to suppliers in their native currency. 27 textile companies in Lancashire have been supported by the N Brown Textiles Growth Programme delivered across the UK and funded by the Regional Growth Fund. Set up by the Manchester Growth Company for the Combined Authority in Greater Manchester and the Alliance Project, this programme has created or safeguarded 443 jobs in Lancashire and encouraged investment by these companies: with over £1.7m of government funding since 2014, the textile companies in Lancashire have invested almost £7m. 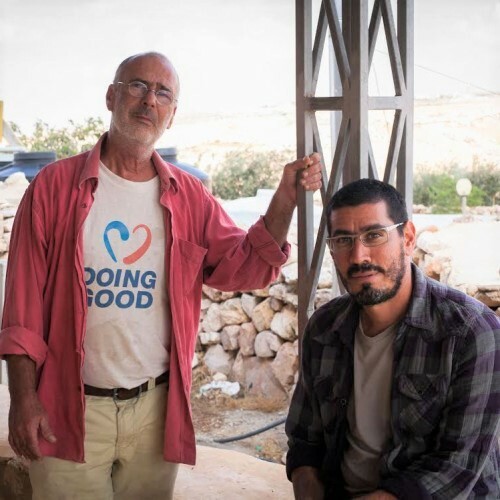 In 2009 Israeli physicists Elad Orian and Noam Dotan (below) set up an Israeli group Community Electricity and Technology Middle East (COMET-ME which became an Israeli-Palestinian NGO). It was initially set up to help people to make their own renewable power, funded in large part by the German foreign ministry. As work proceeded, from 2012 onwards, several disturbing reports came of threats to this work. The following paragraph is typical of such reports. 2013 HEBRON (Ma’an) — Israeli forces on Sunday demanded Palestinians remove 10 solar panels from their rooftops in the Yatta region south of Hebron, a local group said. The team often had to erect turbines at night to avoid confrontation with the Israeli authorities who previously halted installations. An escalation from state threats in 2014 was widely reported: settlers destroyed solar panels and olive trees in the West Bank on Thursday, local news agencies reported. A group of settlers from the illegal outpost of Mitzpe Yair attacked and smashed solar panels belonging to a Palestinian community in the south Hebron hills, locals told Ma’an news agency. 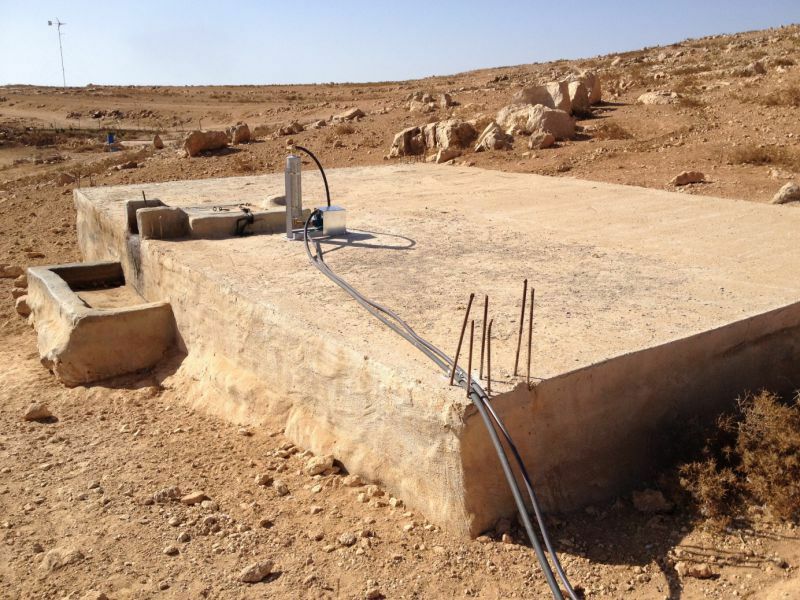 An off-grid solar system in Sha’eb el Buttom, a village in the South Hebron hills. In the background is an illegal Israeli settlement that Israel has fully connected to the grid. 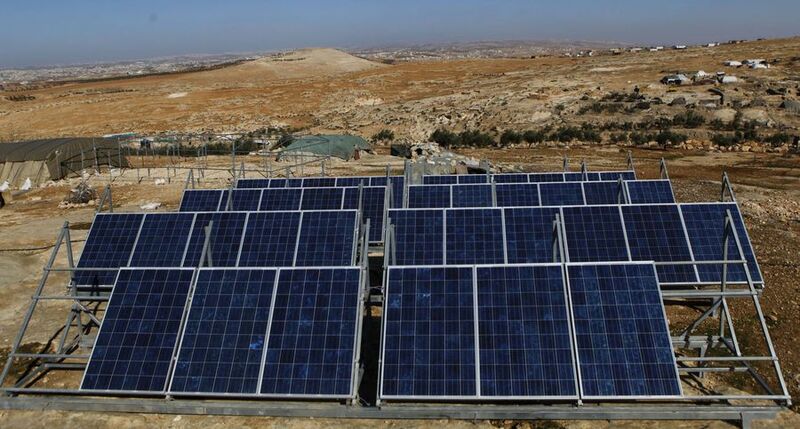 Positive News and SciDev report that, more recently, persistence appears to have won the day, bringing renewable energy to around 2,000 people in 24 villages in the southern West Bank. In 2015 Comet-Me summarised a few years’ work with people in South Mount Hebron to set up small-scale renewable energy systems based on these technologies. These have improved lives and livelihoods by providing clean energy for refrigeration, cooking, making butter and cheese, and communications. Hajeh Nuzha pours milk into a new butter churner, powered by renewable energy. Electric churners slash the time it takes women to make butter and cheese — one of the staple livelihoods here. Many of the villagers in the Mount Hebron hills live in caves such as this one in Tuba. Family incomes have grown by as much as 70% since the electric goods were introduced. Women also use renewable energy to run laundry machines, such as this one in a home in Sha’eb el Buttom. Electricity has “revolutionised the lives of women”, Orian says, because they tend to do household tasks and take care of butter and cheese production. 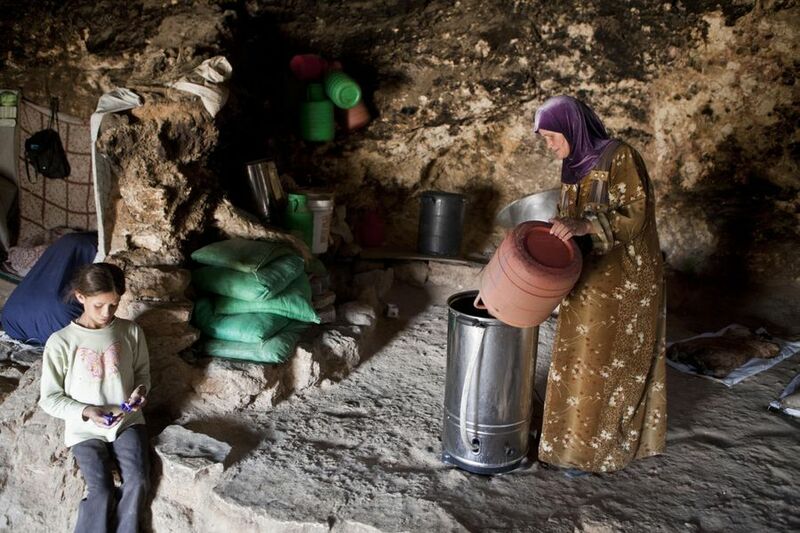 As many Palestinians in Mount Hebron had to rely on rainwater harvesting, Comet-ME has built clean water systems for the communities — 70% of whom, the UN reports, are not connected to the water network. In some villages, people use as little as a fifth of the World Health Organisation’s recommended level. Because this often fails to meet their needs, families have paid high prices for extra water brought in by tanker. To reduce this burden, Comet-ME supplies equipment to improve access to clean water. 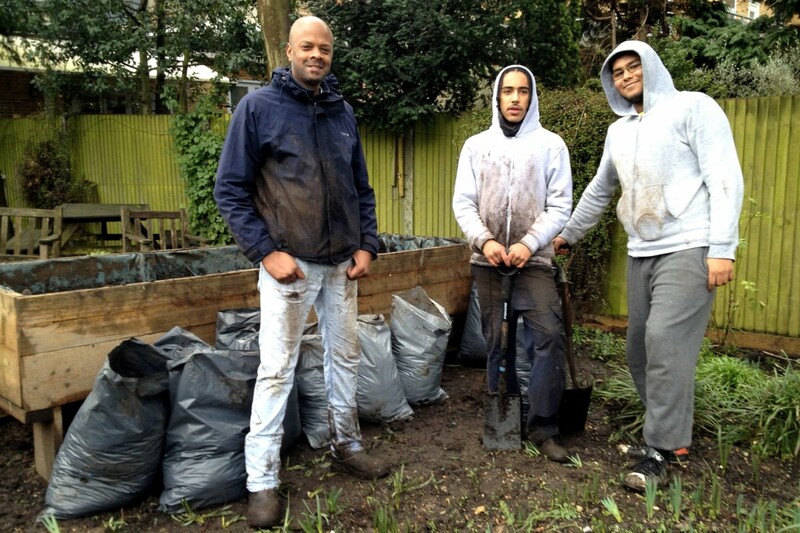 Here the team are installing meters to monitor water use for new water systems. A pump and priming tank on top of a cistern in which rainwater is stored. Pipes carry water from the cistern to homes, where taps are installed. Before reaching the tanks, the water goes through particle filters to clean it. The new systems mean that children no longer have to carry heavy loads of water to their homes. An MRES course is now being offered at Palestine Polytechnic University in Hebron. The Master of Science in Renewable Energy & Sustainability is a project of eight universities, three from European countries & five from Mediterranean countries, with financial support from the European Union (EU) under the umbrella of TEMPUS projects. It aims to establish a program that will effectively utilize the renewable energy resources and help to support the sustainability of these sources and local environment. 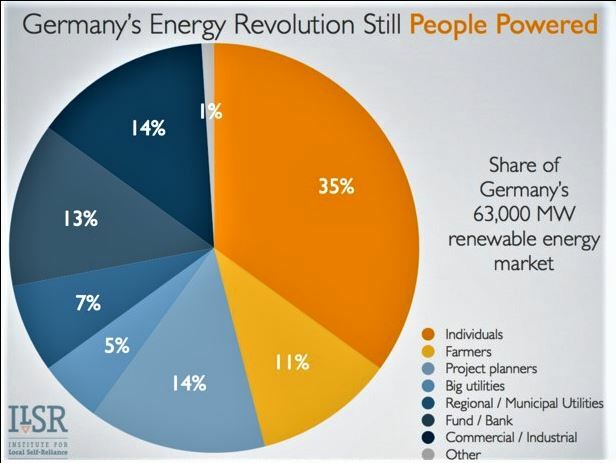 A 2015 National Geographic article with the most remarkable photographs: Germany Could Be a Model for How We’ll Get Power in the Future … led to the ISLR article written earlier this month. 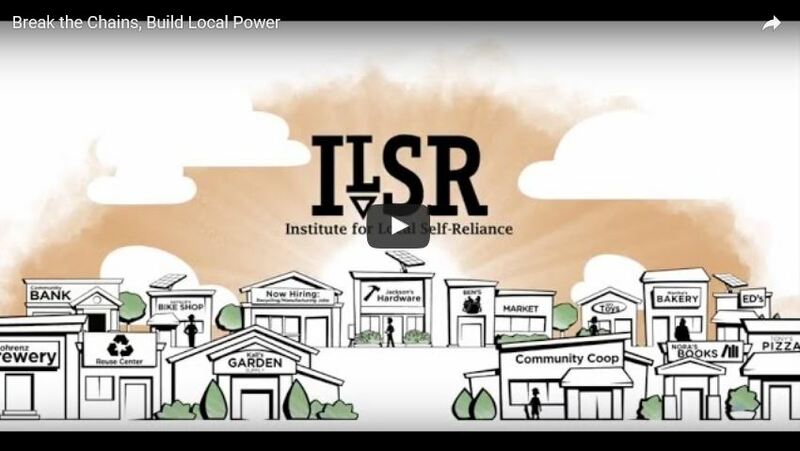 The Institute for Local Self-Reliance (ISLR) informs readers that its mission is to provide innovative strategies, working models and timely information to support environmentally sound and equitable community development. To this end, ILSR works with citizens, activists, policymakers and entrepreneurs to design systems, policies and enterprises that meet local or regional needs; to maximize human, material, natural and financial resources; and to ensure that the benefits of these systems and resources accrue to all local citizens. Instead of expanding or connecting to the national energy grid, some companies, municipalities, and individuals are creating miniature grids of their own that can operate independently – “microgrids” – providing options for groups that want lower energy bills, more control over where their energy comes from, or a level of reliability that the grid cannot provide. Regulations governing interconnection processes can also hinder microgrid adoption, particularly because these regulations vary from state to state. Opposition from utility companies is often a factor that makes the regulatory environment hostile or resistant to positive change. In an ideal world, a national standard would be adopted. Richardson concludes: “Perhaps in the future, microgrids will be a common feature of communities . . . connected by the larger grid and selling electricity to each other as necessary. For now, they represent a useful tool for businesses and communities that need reliability that the grid can’t offer or that can leverage scale to reduce energy costs”. 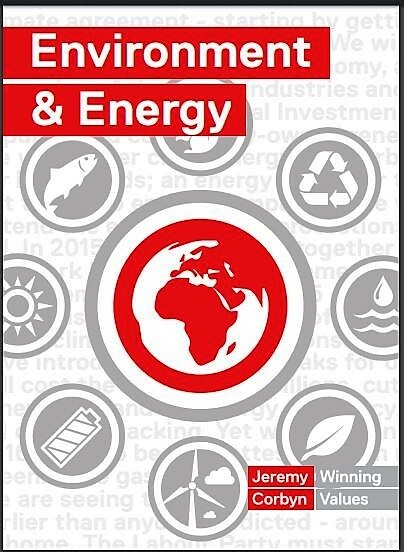 Corbyn has launched an environmental manifesto that outlines his plans for the UK to achieve 65% of energy from renewable sources by 2030 – without fracking. He undertakes to use the precautionary principle to protect the environment and people from harm – not a pay-to-pollute approach allowing the richest corporations and individuals to wreck our planet. a ban on the use of neonicotinoid pesticides which harm pollinating insects including bees and encourage bee-friendly plants in our parks, urban spaces and countryside. Jeremy Corbyn also encourages the British public to take action as individuals to help to meet the Paris climate agreement. A “publicly run, locally accountable energy system”. He has promised to promote over a thousand local energy companies in the next parliament and legislate to give community energy co-operatives the right to sell energy directly to the communities they serve. It would launch a National Home Insulation plan to insulate at least 4 million homes and phase out coal-fired power by 2025. 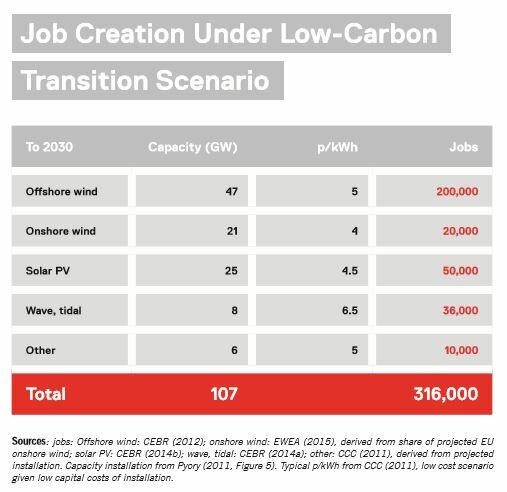 The Labour leader estimates over 300,000 jobs would be created in the renewables sector as a result of these measures. At the event in Nottingham, Jeremy Corbyn said that Labour would reinstate the department for energy and climate change in its first month of government, as part of its plan to rebuild and transform Britain, “so that no-one and no community is left behind”.